On October 1 I presented data showing that Wyoming state and local governments are more costly than in any other state except New York. 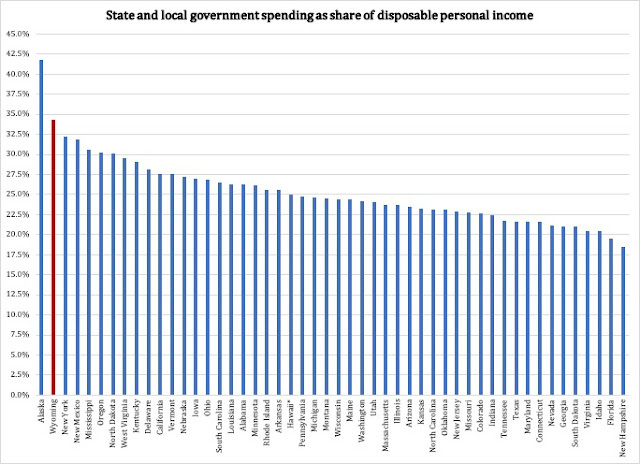 Today, we look at the same data from the expenditure side, only now, we divide total expenditure with disposable personal income (as opposed to total personal income). In 2016, total state and local government spending in Wyoming added up to almost 10.1 billion. After personal current taxes, Wyoming families had a total of $29.3 billion left in the form of disposable income. This means, plainly, that our state and local government spent an equivalent of 34.3 percent of all disposable income earned in Wyoming. Only Alaska had a costlier government, at 41.8 percent. The use of disposable income allows us to get an idea of how expensive government is after we have paid all personal current taxes. Whatever new taxes would be added on, would come directly out of the money left - disposable income. Some have criticized the use of personal income - disposable or not - because we do not pay all taxes out of our personal income. That is a good point, but it is also moot. All taxes are ultimately paid by individuals. Income taxes, property taxes and taxes on consumption (for example, sales and excise taxes) come directly out of our personal income; for business owners who file under the personal income tax code, they de facto pay their business taxes out of personal income as well. Even taxes that are paid by corporations eventually burden personal income. Every dollar a business pays in taxes is a dollar it cannot spend on wages and salaries, employee benefits and bonuses, or stock dividends. A corporate income tax (which we may soon have here in Wyoming) is imposed on the corporation at its current sales, forcing a reduction in spending on other items, including employees. If businesses respond to a tax hike by raising prices, the eventual effect is a reduction in our purchasing power. It is called "inflation", and its origin in tax hikes seems to be a secret that many politicians are unaware of. The bottom line is that so long as our legislature is unwilling to pass meaningful, structural spending reforms, the only way they can keep funding their large government (and eliminate their budget deficit) is to take more money out of your disposable income. Big Tax wants to grab more of your money. Help me fight for Wyoming taxpayers. Help me build a new think tank to educate everyone in our great state about the cost of government, the dangers with higher taxes and the alternatives. Donate today and help me through the start-up process to open the Wyoming Center for Political Economy.